Bolivia last August to study the Sajama (the country’s highest peak), the Huayna Potosí and the Jhanko Laya, three very different mountain types that marked the start of the project. These three mountains were carefully selected and the members of the expedition also climbed a fourth mountain, the Acotango (between Chile and Bolivia), and visited an active volcanic area near the Sajama’s national park. Due to the presence of working mine, Acotango’s area does not receive the park’s protection. The expedition, which enjoyed the support of well-known Bolivian mountaineers including Father Antonio Zavatarelli, met with representatives from the International Mountain Guides Association (IMGA) in Bolivia, the forest rangers from the Huayna Potosí’s refuge, the famous Dr. Hugo Berrios and different associations and mountain agencies that work in this country. The aim of these meetings was to carry out a more accurate analysis of the situation and of the wilderness state of Bolivia’s peaks. During the journey, the four members of the expedition also took part in a project to reintegrate young people from the area, training them to a professional level in mountain sports, they also made the first contacts to establish a Mountain Wilderness chapter in the Andes. information about the project. “Wilderness” can be defined as untamed nature that has not been altered by human activity. This spirit of wilderness is becoming increasingly difficult to preserve as it becomes overrun with facilities which, due to a lack of control, occupy unspoilt areas and promote sports such as heliskiing, turning mountains into adventure theme parks. 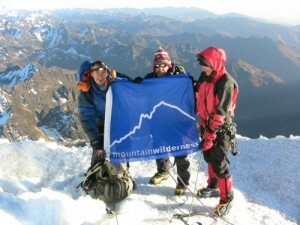 Mountain Wilderness International was founded in 1987. Year after year, it organises awareness campaigns and protests to defend the unspoilt state of mountain areas to ensure that they can be enjoyed by both present and future generations.